Yoel Goldman’s All Year Management and Joel Gluck’s Spencer Equity landed a $117.5 million loan for a newly completed Downtown Brooklyn rental tower, property records show. The property, called the Azure, is located at 436 Albee Square, just a few blocks from Fort Greene Park. Spencer Equity and All Year are equal partners in the development, with each holding a 50 percent stake. The 28-story property contains 150 apartments and was previously appraised at $167 million. The financing came from lenders represented by Tel Aviv-based Mishmeret Trust Company Limited, records show. The investors assumed the $105 million of debt on the property, which was set to mature in July. The loan package also included a $12.4 million gap mortgage. Last May, the joint venture announced its intent to raise $118 million in bonds in Tel Aviv. The joint venture partners have experience with Israeli debt. 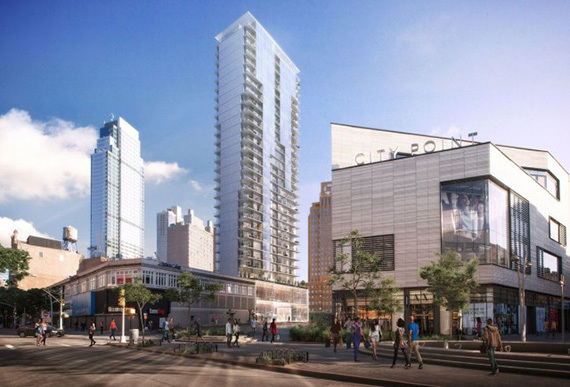 Gluck is sourcing funds for his $50 million acquisition of 2911 West 36th Street through Tel Aviv. Meanwhile, All Year Management previously used the exchange to refinance the William Vale Hotel in Williamsburg and the Rheingold Brewery rental development in Bushwick. The company raised more than $500 million across five deals in Israel just in 2017 alone. All Year and Spencer Equity did not immediately respond to requests for comment.